Perched on a steeply inclined surface over swamps, the single story residence slides gracefully between the trees and is only hardly visible from the street. As per the occupants’ and architect’s wishes, the house has a dual relationship with its environment; from the outside, it is camouflaged in its setting and is as discreet as possible. From the inside, the house is completely open to its surroundings, and its occupants are met with scenery that is in constant evolution. 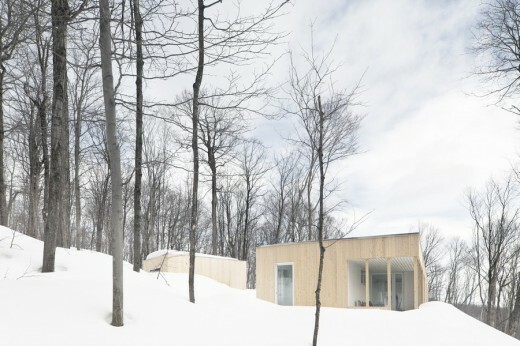 In both cases, the house gives way to the wild grandeur of the Laurentians. 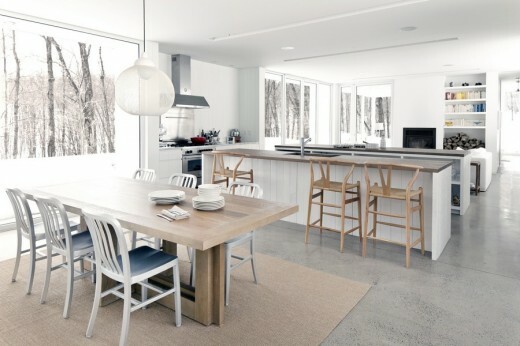 The Blue Hills House, through its refinement and simplicity, allows for a harmonious coexistence between man and nature. By establishing a comfortable, relaxed and light environment, living in this home is akin to perpetual holiday. 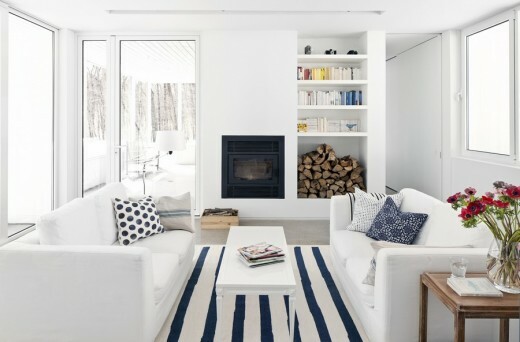 Hidden within the wooded hills of the tiny municipality of Morin-Heights, the Blue Hills Home is a refuge for a family that chose to leave their urban environment for a more natural and spacious setting. The project consists of a 2300 square foot single family home with an adjoining garage. Perched on a steeply inclined surface over swamps, the single story residence slides gracefully between the trees and is only hardly visible from the street. As per the occupants’ and architect’s wishes, the house has a dual relationship with its environment; from the outside, it is camouflaged in its setting and is as discreet as possible. From the inside, the house is completely open to its surroundings, and its occupants are met with scenery that is in constant evolution. 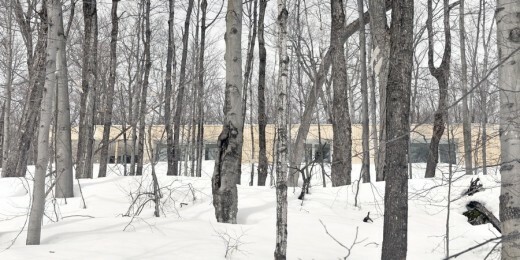 In both cases, the house gives way to the wild grandeur of the Laurentians. In order to meet this double challenge, a series of tricks were used during project conception. The exterior walls, entirely covered with vertical eastern cedar slats, will age progressively over the years, emulating the color of the bark of surrounding trees. Certain sections of these walls are covered with wooden slats, thus creating a subtle relief on the facades that interacts with the verticality and rhythm of the surrounding forest. On the flat roof, a bed of river pebbles echoes the colors that can be seen in the adjacent soil; therefore, the structure becomes very difficult to distinguish from its surroundings when observed from the top of the hill. The fact that this is a single story project allows the house to maintain a minimal height, and thus reduces the footprint on the local environment. Careful attention was also paid to preserving as much of the existing flora as possible. As a result, the linear tapered layout of the building allowed it to sneak into the existing context while diminishing the amount of alterations needed, and also allowed for a minimal difference in height between the front and rear of the house. This low and straight structural implementation allowed each interior space to have a direct visual link to the vegetation present on the site, and is thus conceived as an extension to the house’s interior flooring. This allows for maximum interaction with the exterior, while optimizing penetration and propagation of natural lighting within the main structure of the home. Openings on the frontal façades of the building were placed inside a series of alcoves, allowing occupants to open windows even in rainy weather. In addition to serving as protection from inclement meteorological conditions, these alcoves participate in defining a transitional zone between the interior and exterior, a permeable threshold where the white inner walls act as an extension to the house’s interior walls and ceilings. Furthermore, these alcoves block direct sunlight in the summer which protects from overheating due to the large windows while letting through low winter sunlight which contributes to interior heating. 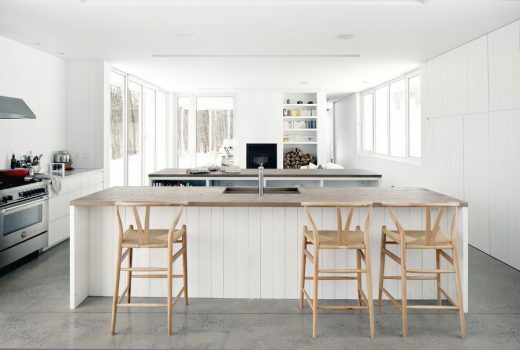 This principle works marvelously with the exposed concrete floor that acts as a thermal mass. Given that it is in the shade during the summer, the concrete floor helps cool the house. However, since it is exposed to the sun during the winter time, it contributes to heating the surrounding space by storing solar energy and redistributing it in a uniform fashion thanks to incorporated water pipes. In order to enter the house, the occupant must pass through an alcove located at the center of the northern façade. 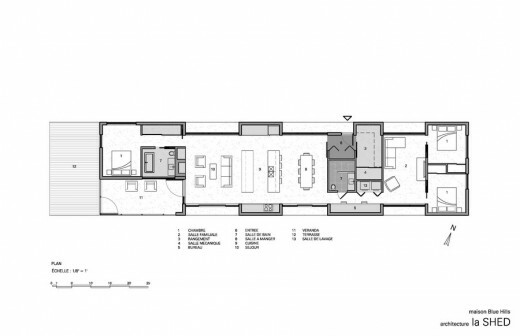 The layout is designed in a hierarchal fashion, with common spaces located at the center of the structure and private spaces located at its extremities. Once past the vestibule bounded by a metallic scraper mat, the living spaces are grouped in one place; the kitchen, consisting of two large islands, separates the living room from the dining room. At the very heart of this project, the islands contribute toward making the kitchen a functional and welcoming space. The island adjacent to the dining room contains a lunch counter, whereas the island adjacent to the living room contains a library. These two stretches of furniture therefore act as an interface echoing the functions of spaces adjacent to them. Large openings located at either end of each common space are equipped with full height sliding doors that allow for an even more intimate relationship with nature. The fireplace and integrated furniture are built-in between the alcoves and within partitions in order to clear the central rectangular area and participate in the minimalist aesthetic qualities of the house. Service spaces are located between the central area and bedrooms in order to create a gradual transitional zone leading toward private spaces. Thus, the bathrooms, utility room and numerous storage spaces filter and absorb noises while sending a signal to the occupant that he is heading for the home’s private spaces. Materials found within the home evoke the surrounding natural environment. 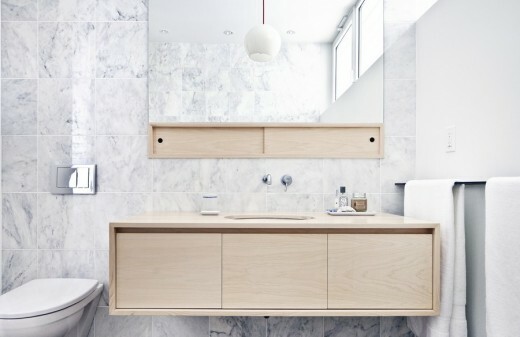 Usage of authentic and raw materials such as the wood on the walls, the marble that envelops the bathrooms or even the polished concrete on the floors ensures that the home will hold long lasting quality. The raw wood coating on the walls was painted white with the purpose of creating a more luminous living space, while preserving the material’s natural texture. This helps create a warm, welcoming and delicate atmosphere that is most coveted by the house’s owners. 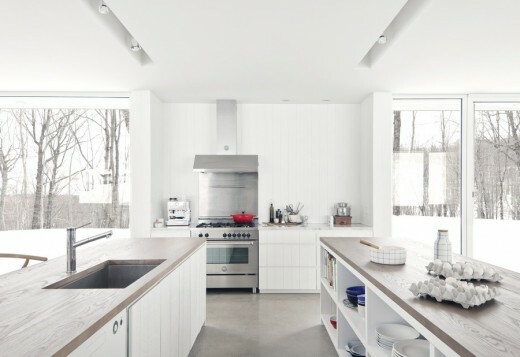 The whiteness of indoor spaces creates a canvas that changes colors with the surrounding setting as the seasons turn, and allows occupants to experiment with a constantly changing living environment. 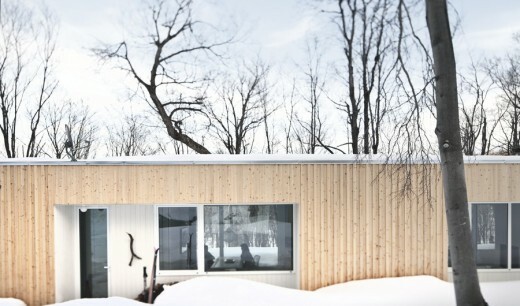 The atmosphere created by this sober amalgamation of materials and textures provides the house with a uniquely Laurentian character. The veranda, essentially an extension of the living room, allows occupants to enjoy the outdoor space in what are at times difficult conditions, especially due to harsh weather and the numerous insects present on site. Located on the front façade, this space emulates the typology of surrounding houses which are adorned with spacious porches and verandas. 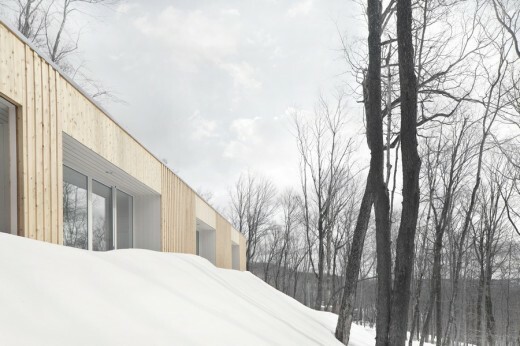 The Blue Hills House, through its refinement and simplicity, allows for a harmonious coexistence between man and nature. By establishing a comfortable, relaxed and light environment, living in this home is akin to perpetual holiday. As a company that performs the majority of its work in the residential and commercial sectors, la SHED has developed a thorough expertise in the renovation, transformation and construction of buildings of all types and all historical backgrounds. Openness, lighting and alignment are at the very core of all projects completed by the studio. Our achievements stand out as a result of their functional and contemporary layout, as well as their use of materials that are durable, affordable and classical. The importance given to finishing touches and the general quality of our achievements is, amongst other reasons, a result of tight monitoring throughout the entire project execution process from start to end of construction. The reconfiguration of exiguous spaces, the optimal usage of space and dealing with precise and restrictive budgets are all constraints that La SHED has excelled at dealing with in the past, managing to conceive seductive and intelligently designed spaces regardless of limitations. 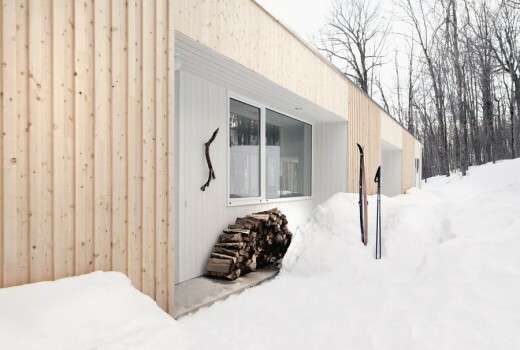 The firm was established when architect associates Sébastien Parent, Yannick Laurin, Renée Mailhot and three talented employees all united by a passion for architecture, design and Montreal, decided to team up to form La SHED. The studio is dedicated to a new type of architectural relationship, where to call an architect would scarcely be stranger than hiring a webmaster – a relationship where conceiving your own living space would neither be a luxury nor would it be utopic. 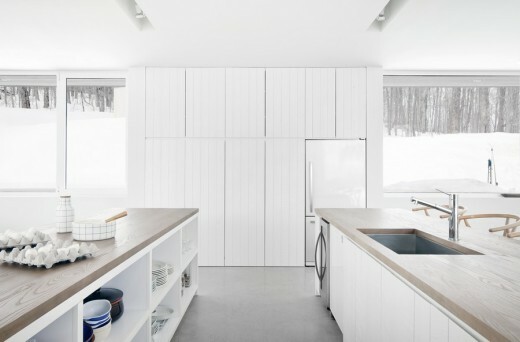 Upon completion of its second project, la maison Demers, la SHED was overwhelmed with critical success and has since been highlighted in a number of specialized magazines and has received a variety of design awards. Even though the team now has six members, all decisions are made as they were on the first day – they are “submitted to the board” around the same large table.